Dozens of domain extensions to choose from. Search results display all domain types and prices. List below covers most popular. REGISTER / RENEWAL PRICEThis is the annual price for initial registration of the domain and renewal. You can register domains for up to 10 years. TRANSFER-IN PRICEThis is the fee to transfer a domain in to us, from another registrar. The fee is paid to us at the time of initiating the transfer, which we pay to the registry. 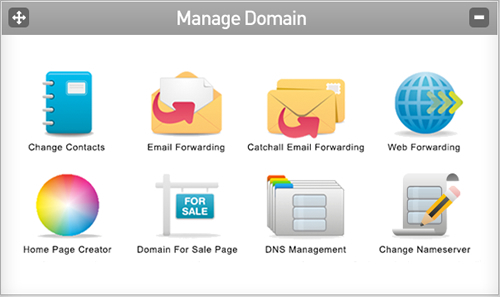 Each and every domain we register and manage includes all of these free features as standard. Your domain order is processed in real-time, direct with the registry. Meaning your domains will be secured and ready to use right away. Web Forwarding lets you forward your domain to another web address. We provide fast and simple setup of both Automatic and Framed redirection. Email Forwarding allows you to forward any address on your domain (you@yourdomain.co.uk) to another email address, perhaps a btinternet or gmail address. Catch-All Email Forwarding allows you to forward anything@yourdomain.co.uk to another email address, perhaps a btinternet or gmail address. Need to point your domain name at different name servers? This feature gives you the flexibility to point your domain names to a third party DNS service, another host or a dedicated server at any time. But you’ll lose all the benefits of our extensive range of free DNS services if you do! The service is free and fully automated. For use if you wish to consolidate your domains with another registrar. We don’t charge release or transfer-out fees, like other registrars/hosts. Keeping your domains contact information up to date is important. Edit contact details easily using our domain control panel. DNS Management allows you to configure your own DNS records. All A CNAME & MX records for your domain can be altered. You can also create SPF and SRV records. If your domain is registered as a private individual, this feature lets you hide your personal details from the public Nominet whois database. We lock all new domains and transferred-in domains by default; you only need to unlock a domain if you are intending to transfer it to another registrar. Only you can unlock your domain in the control panel. Our Google Apps DNS Wizard allows you to easily enable email and other Google services on your domain. With just a couple of clicks you can set the DNS for your domain to point at Gmail and any other services you select. You have access to the domain management control panel (see screenshot below). Providing you with real time control over your domain. Edit DNS, email forwarding, domain contacts and more.